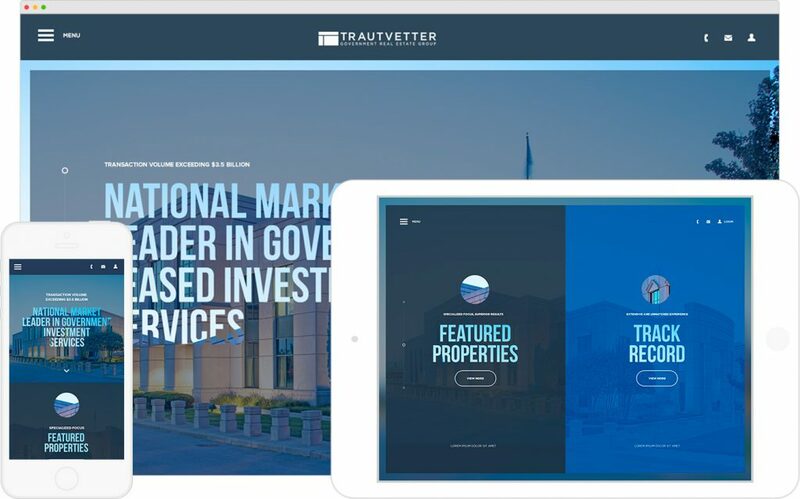 Cushman & Wakefield Trautvetter (The Government Real Estate Group), the most active government property sales broker in the United States (transaction volume exceeding $3.5 billion), recently rejuvenated it’s digital presence with the team at inMotion Real Estate Media. The new website exhibits the full scope of the properties in their portfolio as well as the caliber of their professional, experienced team. Working on new projects always presents a learning experience, and the Design and Development team at inMotion really stepped up to present a solid product that fulfills their digital marketing and sales needs. Cush Wake Trautvetter wanted to match the quality of their services and team with their online presence. Creating a modern, sleek website was paramount. It was important to display the impressive presence of their property portfolio while not leaving end users overwhelmed by the amplitude of their offerings. Additionally, the team wanted to create an online tool to help them streamline their sales and investment pipeline. They required a comprehensive investor portal for potential investors/buyers to easily execute Confidentiality Agreements (online) and then access specific investor documents for the respective properties. After the initial planning session, inMotion architected, designed and developed a completely custom website (front end and back end) built from the ground up to enhance the user experience of investors/buyers interested in The Government Real Estate Group’s service offerings and investment opportunities. inMotion is really excited to share this project with Cush Wake Trautvetter to the public. It represents the full scope of the teams’ ability to create a high quality product with a variety of elements that best represent the client and serve as an effective sales and marketing tool.